Basement of Ghoulish Decadence: The First Horror Film on Home Video...? The two formats most associate with home video's birth, VHS and Betamax, weren't technically the first to market. Cartivision, an analog video format introduced in 1972 and built into specialized televisions, was the first to offer movies in the home, but only as one-time viewing rentals. The format died off after only a year and I can't find a title catalog so there's no way of verifying if Cartivision had any horror films. In 1977, Magnetic Video Corporation was launched and became the first distributor releasing titles for both sale and rental on VHS and Beta (and soon after DiscoVision). MVC initially offered fifty titles with none falling into the horror genre. 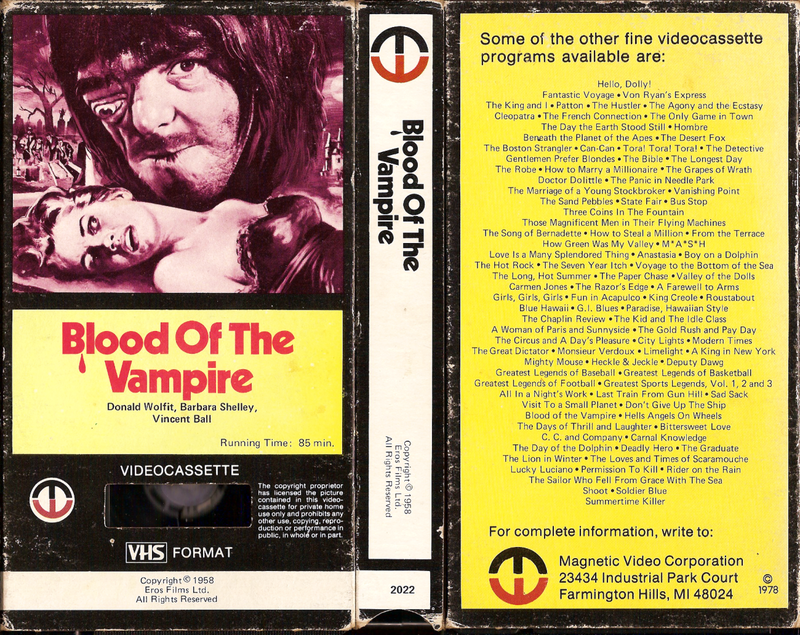 The only other title that might pre-date or match the video release year of Blood of the Vampire (1958) is Magnetic's The Omen (1976). I still need to confirm this. Although other notable early horror videos like Night Watch (1973), Blood Rose (1969), The Sorcerers (1967), Welcome to Arrow Beach (1974) and Carrie (1976) all arrived in 1979. Needless to say, this tape is extraordinarily rare like all of MVC's earliest releases. I have a MVC tape of City Lights from 1978, actually. I didn't realize they had so many releases. This is a good question to ask. The only problem is that it is hard to tell which tape actually came out first just by looking at the copyright year (and also you can't tell if one tape came out earlier than another within the same year). However, if you can isolate the first horror film released by MVC, I think that's it for the US. However, there were also VHS releases in other countries (maybe only in Asia) that predated MVC. While I agree Japan might have gotten a horror title on VHS/Beta before the U.S., it's not hard to figure out with the copyright year and catalog number. The first U.S. VHS VCR debuted in late 1977 with MVC debuting it's first fifty titles in October. So '78 had to be the first full year of title availability spearheaded by MVC. I just mean it's hard to tell when a tape was actually released just from the copyright date on the tape itself. Sometimes it may have actually come out a year later or something like that (and you wouldn't know the month). Obviously, if you do some actual research, you can probably figure it out. Japan or Korea MAY have gotten there first with the 1st horror VHS. That would probably be the only other bet. If we can't trust the 1978 copyright, this either came out in 78 or 79, since Magnetic began "specializing" their boxes per title and changing their logo by 1980. I'll have to look around for more info on MVC's catalog numbers. Also Magnetic's tapes have two copyrights, one for the film and one for the release. So I'm inclined to think the year on the back cover's notice is the video's year of release. Looking quickly Night Watch's catalog # is CL-5005, copyright film 1973 / box 1979.